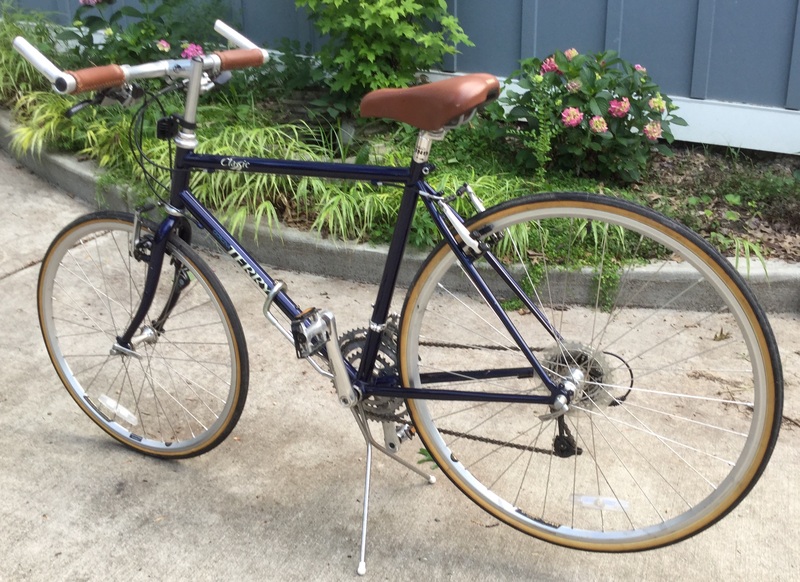 With my interest in bicycling renewed, I took a look at my older road bike. This bike seemed like a good item to sell on eBay and I learned that a local bike store would pack and mail it for me, for a fee, of course. Last weekend, I took the bike outside to wash it before I took photos of it for my future eBay posting. As I washed every inch of the bike, I fell in love with it all over again. It’s a Terry Classic — a glorious road bike designed for women by Georgena Terry, a mechanical engineer and avid cyclist. This particular model in this particular size, perfectly fits me. It’s such a beautiful bike and so much fun to ride that I thought I really should keep it. I’d only get a few hundred dollars for it and I can go back to riding it once I completely regain my confidence on my hybrid. Then, I started to get on the bike and realized I couldn’t get my leg over the seat or the top tube. Gad, my hips were too stiff from sitting at a desk for years. I realized that I had aged out of this type of bike and thought that I might as well sell it. Back inside, I decided to consult Google. I searched, “Can’t swing leg over bike” and discovered that quite a few people have the same problem. Then I found exercises for loosening hip muscles at 12 Hip-Opening Yoga Poses and decided to give that a try. So far, I’ve only tried the Reclined Bound Angle Pose, and already I can feel some slight improvement in my hip flexibility. Conventional wisdom for many years has been Use It or Lose It, but researchers are finding that even the elderly can make improvements in their strength and flexibility if they work at it. I resolve to work at it. When I moved to a new town in late 2008, I found the hills and valleys around town were just too steep for me to enjoy a bike ride. I road my bike on vacations, but that didn’t amount to much riding time. With thoughts of an active retirement in Tucson in my head, I drove around my small town last week and found some streets with more gentle slopes that I felt I could handle uphill and downhill on my 8-speed hybrid. I discovered that going back to cycling after a long time away was not so easy. We’ve all heard that you never forget how to ride a bike and scientists have apparently proved this, according to this article in Medicine & Health/Neuroscience. What people don’t forget is how to balance and pedal. You can, in fact, forget how to start and stop. After finding my bright green T-shirt, water bottle, helmet, and iPhone (in case I got lost), I went out for my first ride in years and discovered that I couldn’t remember how to start. Did I put my foot on the top pedal and push off? Or was it the bottom pedal that I started on? Settling on putting one foot on the bottom pedal and pushing with my other foot until I was going fast enough that I wouldn’t fall over, I was finally up and pedaling. Fifteen minutes later, I was exhausted. My legs were achy and trembling and sweat was pouring down my face. Not discouraged, I went out the next day and found it a little easier going and rode for a half hour before finally getting off the bike and pushing it off up last hill. There’s a long way to go to become the confident, strong bike rider I was as a child, if that’s even possible. The best part of riding a bike, to me, is feeling the breeze on my skin on a hot day. 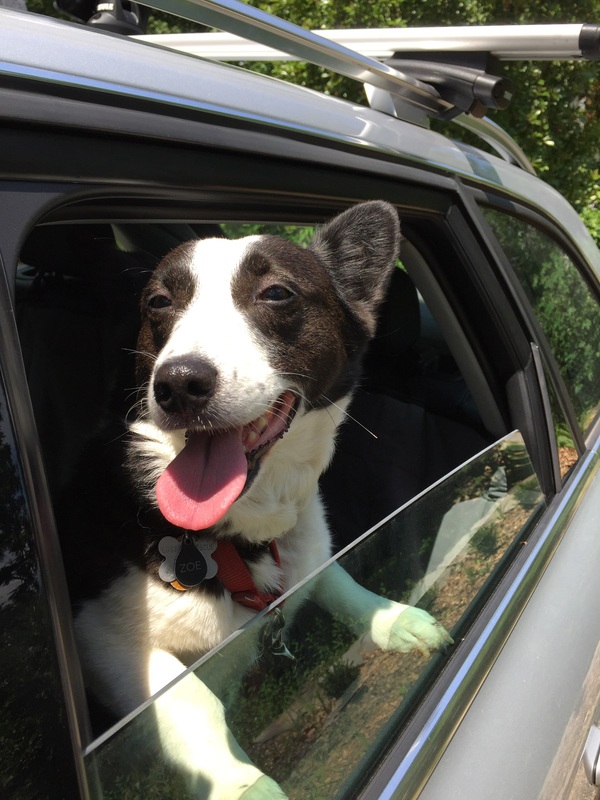 It’s no wonder that a dog likes to stick his head out of a car window to feel the wind in this face! One thing I like about Tucson is that it’s a great place for riding bicycles. There are a number of websites devoted to cycling in Tucson, including the city’s bicycle program that describes plans, improvements to trails, and other local cycling issues. Visit Tucson writes that Tucson is the third best bicycling city in the country, according to Bicycling magazine. The Visit Tucson website also has information about its 500 miles of metro bikeways. Another useful resource, Arizona Bike Rides, describes Tucson’s best bike rides. Tucson seems to have the greatest number of bicyclist fatalities of any major city. I don’t know if the drivers aren’t careful around bicyclists or if bicyclists aren’t careful around cars. One of the features of my Tucson dream was that my house had no clutter. In my Tucson dream house, there were only items that I needed or loved for their beauty, as prescribed by William Morris. So, it was time to sort through things and get rid of stuff I didn’t need before moving to Tucson. On amazon, I found a wonderful little book on tidying – The Life-Changing Magic of Tidying Up: The Japanese Art of Decluttering and Organizing by Marie Kondo. She recommends “weeding” (my word) only one type of item at a time, starting with clothes. After going through my clothes and deselecting piles of clothes I didn’t like or they didn’t fit, I started on linens. The result was six black contractor-type plastic bags of clothing and linens donated to the Salvation Army. It’s a start.